Our most popular webpages, especially in the summer season, are the directories for farm to table dining. And our most popular webpage is consistently the Massachusetts dining directory, very likely the result of the state’s attraction for vacationers. Our Massachusetts dining directory has over one hundred listings including twenty listings in Berkshire County, from Chester to Williamstown, with multiple listings in Great Barrington, Lenox, and Pittsfield. The popularity of The Berkshires as a summertime destination for visitors is not only rooted in the region’s natural beauty, but also Berkshire County’s extraordinary variety of cultural venues. 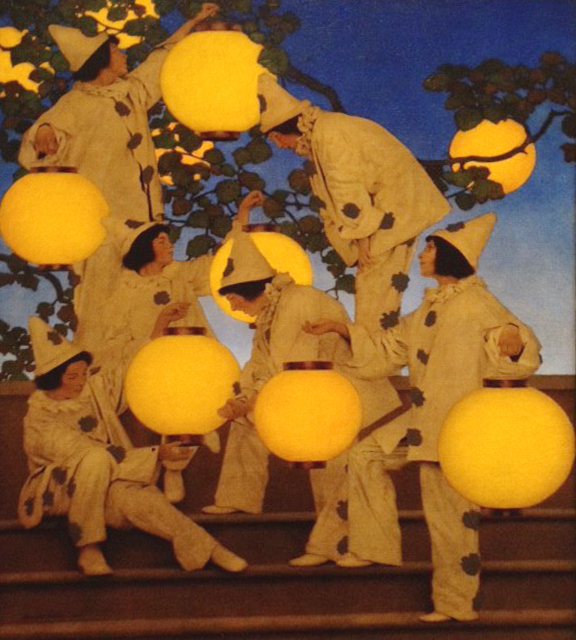 A magnet for vacationers are those with a focus on art: Clark Art Institute, MASS MoCA, Williams College Museum of Art, Norman Rockwell Museum, and Chesterwood; theater: Barrington Stage, Berkshire Theater Group and Williamstown Theater Festival; music: Tanglewood; and dance: Jacob’s Pillow. 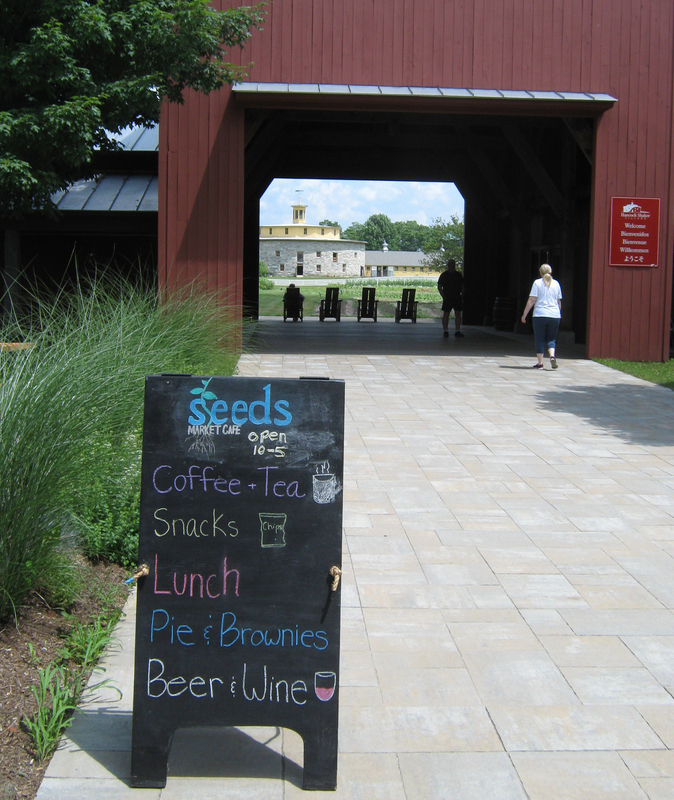 Seeds Market Cafe is located at the 750-acre Hancock Shaker Village, a living-history museum open to the public (from April to December) with 20 authentic Shaker buildings, rich collections of Shaker furniture and artifacts in rotating exhibits, and a working farm with extensive gardens and heritage-breed livestock. (Museum admission is not required to dine in the Cafe.) 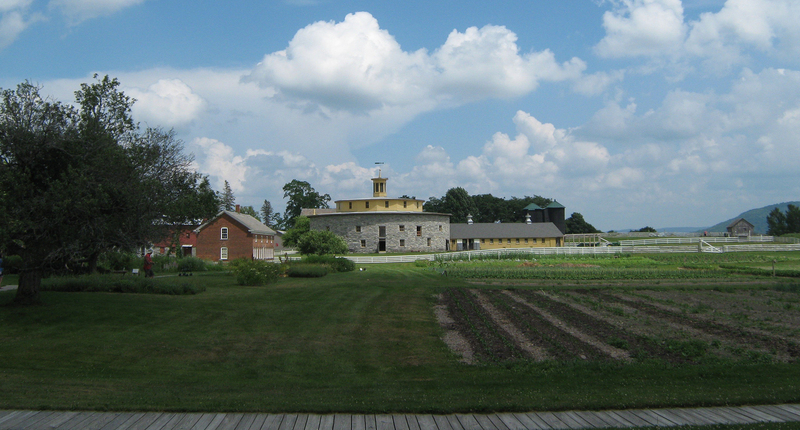 To lunch yards away from the 1826 Round Stone Barn at Hancock Shaker Village is extraordinary. An architectural icon and agricultural wonder, this unique dairy barn originally stabled 52 milk cows. 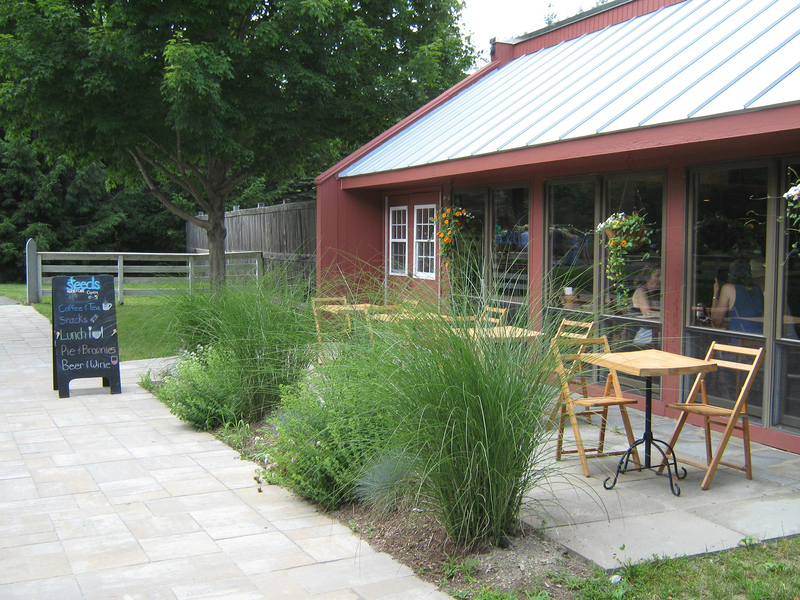 On a recent afternoon, Seeds Market Cafe was a perfect stopping point for lunch on the drive from my home in Albany, NY to Pittsfield for a matinee of The Cake at Barrington Stage, well-reviewed by critic Steve Barnes in the Albany Times Union. The play was as good as expected based on the review, and the lunch was a delicious prelude to stimulating theater. It was an easy decision to make my main meal for the day, a delicious lunch at the cafe. And although meat is not a big part of this mostly vegetarian diner’s diet, Lila’s Lamb Meatballs seemed a special dish to select since I’ve never home-cooked a meal using lamb. Served with charred broccoli caesar and naan, it made for a hearty and satisfying meal. 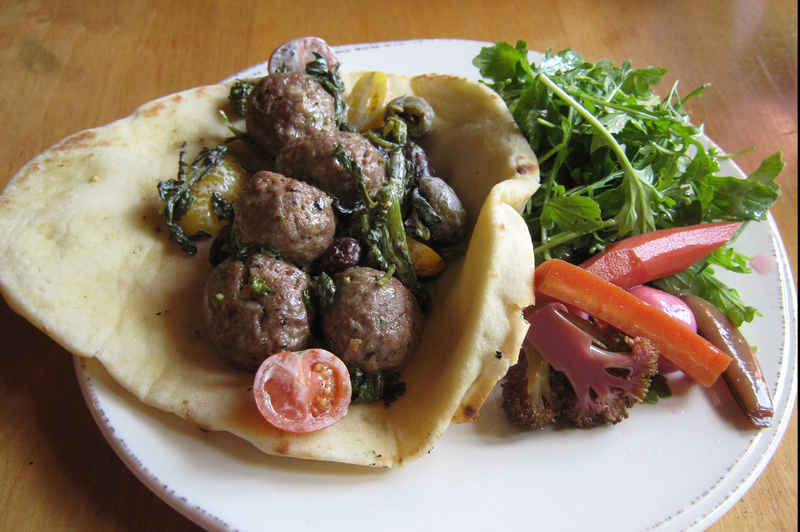 A generous helping of lamb meatballs spiced lightly with Mediterranean flavors was served with the most delicious, warm naan, a pita-like Indian bread. Accompanied with a delicious salad, including charred broccoli, cherry tomatoes, olives as well as pickled carrots, snow pea pods and beets, little room was left for dessert. 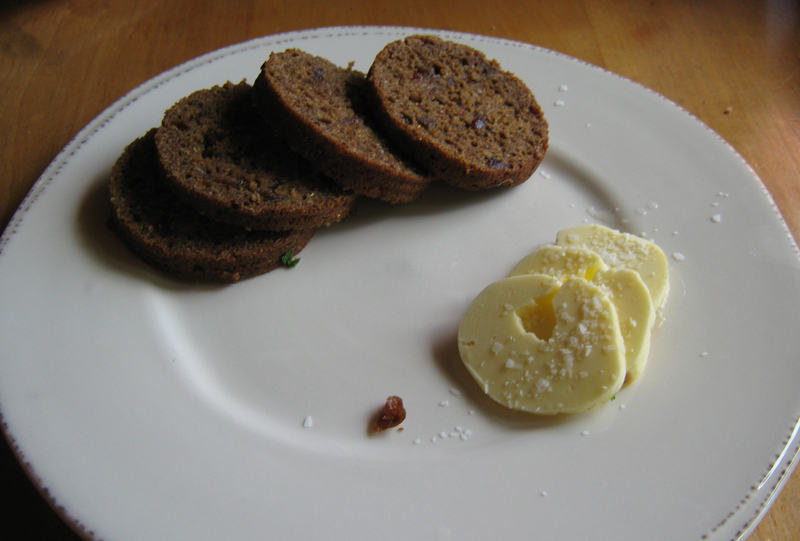 But a serving of Shaker Brown Bread, with Ronnybrook butter and Maldon Salt, with its molasses flavor and not too sweet, was a perfect ending to lunch. Blueberry pie would have to await another visit. 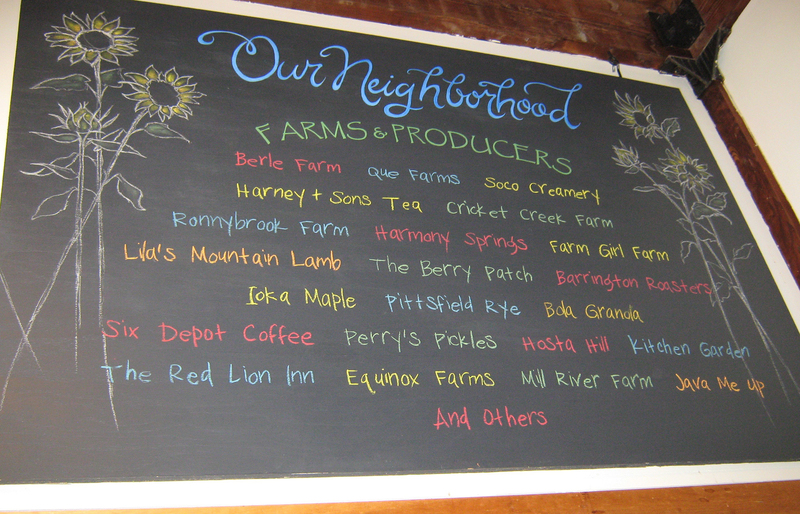 And if you’re fortunate to be a resident of Berkshire County within convenient driving distance of Hancock Shaker Village, consider a CSA (community supported agriculture) farm share. The Village’s organic farm grows heirloom vegetables, herbs and flowers, many of the same varieties grown by the Shakers, on land that’s been in continuous cultivation since the 1790s. Sustainable Shaker land-steward practices, including seed-saving and an all-natural approach to fertilizing and pest control are practiced.